Konungs skuggsjá – by the pricking of my thumbs…(don’t) release the kraken! There are certain varieties of whales in the seas of Iceland that may be eaten by men. One of these is called humpback; this fish is large and very dangerous to ships. It has a habit of striking at the vessel with its fins and of lying and floating just in front of the prow where sailors travel. Though the ship turns aside, the whale will continue to keep in front, so there is no choice but to sail upon it—but if a ship does sail upon it, the whale will throw the vessel and destroy all on board. Then there is a kind of whale called the rorqual, and this fish is the best of all for food. It is of a peaceful disposition and does not bother ships, though it may swim very close to them. Because of its quiet and peaceful behavior it often falls a prey to whale fishers. It is better for eating and smells better than any of the other fishes that we have talked about, though it is said to be very fat; it has no teeth. It has been asserted, too, that if one can get some of the sperm of this whale and be perfectly sure that it came from this sort and no other, it will be found a most effective remedy for eye troubles, leprosy, ague, headache, and for every other ill that afflicts mankind. Sperm from other whales also makes good medicine, though not so good as this sort. Then there is one that is scarcely advisable to speak about, on account of its size, which to most men will seem incredible. There are, moreover, but very few who can tell anything definite about it, inasmuch as it is rarely seen by men—for it almost never approaches the shore or appears where fishermen can see it, and I doubt that this sort of fish is very plentiful in the sea. In our language it is usually called the kraken. I can say nothing definite as to its length, for on those occasions when men have seen it, it has appeared more like an island than a fish. Nor have I heard that one has ever been caught or found dead. It seems likely that there are but two in all the ocean and that these beget no offspring, for I believe it is always the same ones that appear. It is said that when these fishes want something to eat, they are in the habit of giving forth a violent belch, which brings up so much food that all sorts of fish in the neighborhood, both large and small, will rush up in the hope of getting nourishment and good fare. Meanwhile the monster keeps its mouth open, and inasmuch as its opening is about as wide as a sound or fjord, the fishes cannot help crowding in in great numbers. But as soon as its mouth and belly are full, the monster closes its mouth and thus catches and shuts in all the fishes that just previously had rushed in eagerly to seek food. Originally quoted in Lapham’s Quarterly, which says: From The King’s Mirror. Composed in Old Norse during King Hákon Hákonarson’s reign (1217-1263), this anonymous instructive work takes the form of a father-son dialog and may have been intended for the king’s sons. 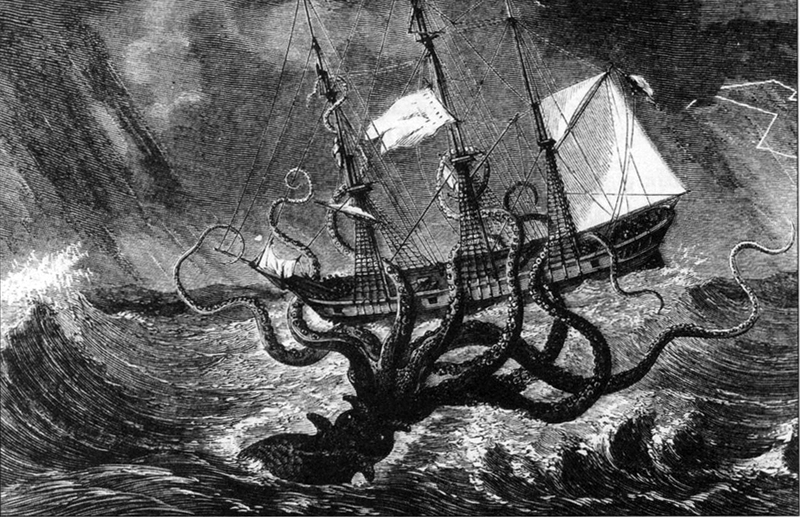 The kraken, a fabled sea monster of Scandinavian invention, may have originated with a rare sighting of a giant squid. In addition to the humpback variety, the text mentions Greenland right, horse, red-comb, and white whales. Muck diving gets its name from the conditions – sediment and mud and so on. Calm and shallow, but low visibility, but then it’s the muck that makes it interesting, as it’s the perfect habitat for unusual, exotic and juvenile organisms that make their homes in the sediment and “trash” that compose a muck dive. Creatures like colorful nudibranchs, anglerfish, shrimp, blue-ringed octopus, and rare pygmy seahorses. Lembeh Strait is near Sulawesi in Indonesia. You’re going to want to view this “large” or full screen if you’ve got the bandwidth. Khaled Sultani, who made this, says: “Lembeh Strait diving – simply one of the best place in the world for muck diving and macro photo+videography. The song is “The awakening of a woman” by Cinematic Orchestra. The technique I used was a simple refocus during the long exposure. Each shot was about a second long, sometimes two. I’d start out of focus, and when I heard the explosion I would quickly refocus, so the little stems on these deep sea creature lookalikes would grow into a fine point. The shapes are quite bizarre, some of them I was pleasantly surprised with. What’s interesting is that unlike usual firework photos that seem to make long trails across the sky, Johnson’s photos look like flowers with little triangular plumes coming to a point. Pretty amazing. You can see several more photos here. 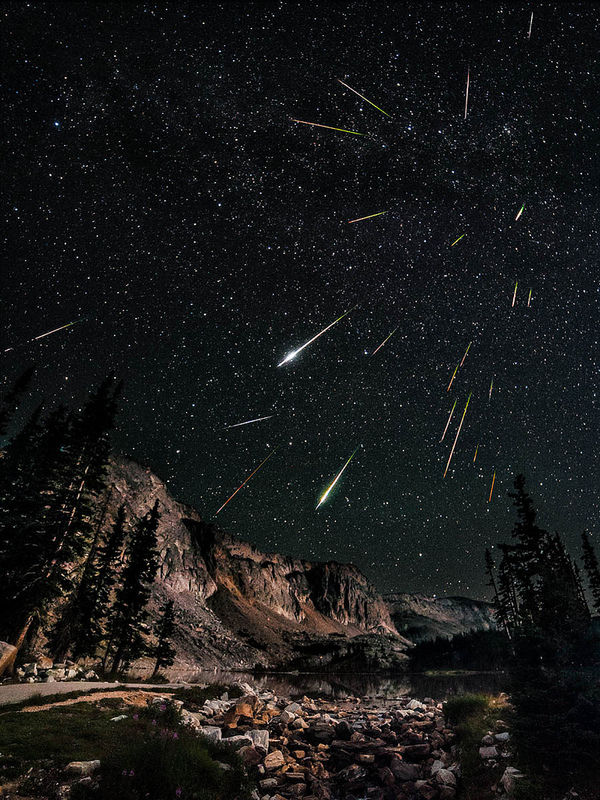 Snowy Range, Perseids meteor shower – we are hurtling through space on a rock! Amazing composite image this. We really are spinning around the galaxy on a big rock. The Perseids meteor shower: The Perseids are a prolific meteor shower associated with the comet Swift-Tuttle. The Perseids are so-called because the point from which they appear to come, called the radiant, lies in the constellation Perseus. The name derives in part from the word Perseides (Περσείδες), a term found in Greek mythology referring to the sons of Perseus. Last night I went out to Snowy Range in Wyoming in search of dark skies for the Perseid meteor shower. I wanted something special for the foreground and I knew the Snowies faced in the perfect direction to get this shot. I started shooting at 10pm and didn’t stop until 5 am, I had to change my battery every 2 hours which made for a long night. The moon rose around 1am to light up the mountain range. I had a great night which was made even better because I spent it with my newly adopted dog Emmie, she was a trooper! But then, you read something like this and look out of the window on a nice sunny day, and think about the walk you’re going to have by the river or the lovely family you’re about to see, and it seems a little silly to let those things come stalking in. I love this poem. You can read it in a funny way too. It makes me feel better.